Thee first thing that struck me when my KOL Foods shipment arrived was the vibrant pink color of the salmon. I could tell that this was a high quality product before opening or defrosting it. 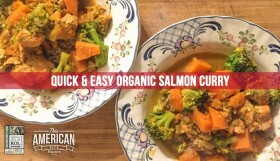 KOL Foods take pride and care in selling organic, grass fed meat and poultry and this farm-raised Alaskan salmon is held to a similarly high standard. Freshwater salmon are free to find nutrition from plankton or other small fish which provide them with the nutrients they need to stay healthy. 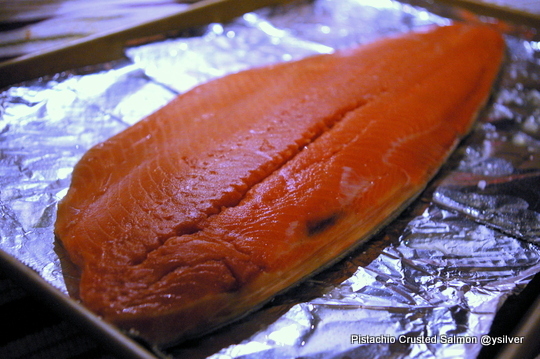 Farm-raised salmon, the cheap frozen stuff from the grocery store, is fed a diet of corn or soybeans which leads to larger, malnourished fish. The beautiful color of a KOL Foods Atlantic Salmon is the sign of a healthy fish — not one that has been pumped with red food dyes to appear pink before hitting the stores. 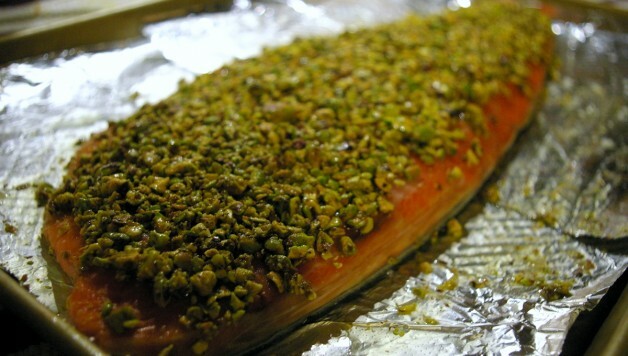 I wanted to do something special with this fish and knowing how popular my Dukkah Crusted Salmon is with you guys, I thought creating a crust using another nut. My mind drifted back to a dish that I haven’t had since the Shabbat (Saturday) afternoons of my teenage years. Each week, our core group of friends would hang out at the same friend’s home, and I remember her mom’s salmon with a nut crust being delicious. Jumping onto Facebook, I emailed my friend to ask for her mother’s recipe. It turns out I was wrong about two things. The best advice I got — advice from a true cook — was “see what’s in the cupboard and play with it!” So I did. 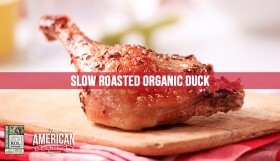 This is an excellent dish, served room temperature or straight from the oven. Best of all, it reconnected me with friends that I don’t speak to anywhere near often enough. 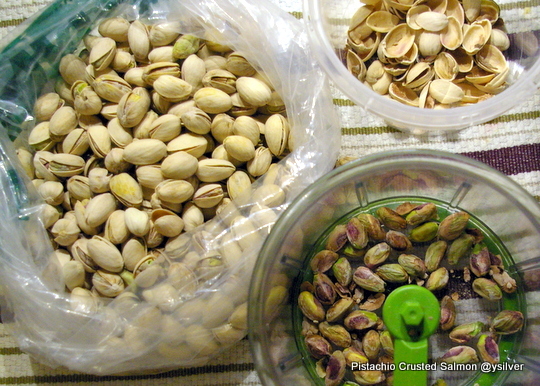 The most time consuming part of it all was shelling the pistachios! 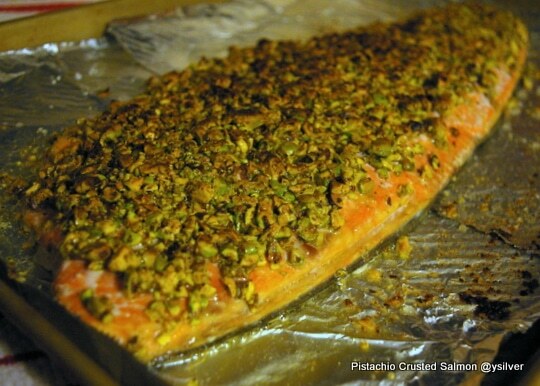 Using salted pistachios adds great flavor to the salmon. Leave the skin on the salon and pat the top dry with a towel. 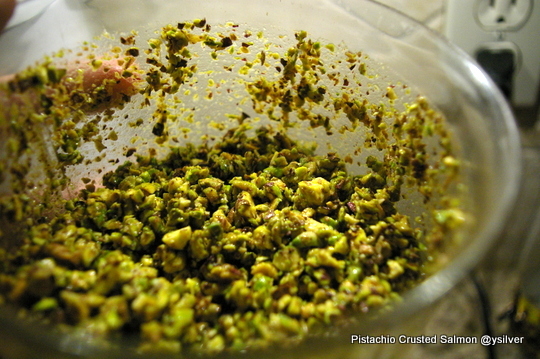 Shell the pistachios and combine them with olive oil in a 4-cup food processor (or my favorite kitchen toy) to create a paste then cover the salmon with you paste to create an outer shell. Pre-heat the oven to 375 degrees. 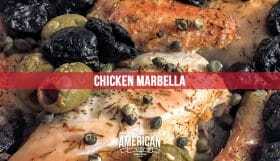 For this recipe you really do want to pre-heat the oven! Once the oven is hot, drizzle some coconut oil or olive oil on the bottom of a baking tray, place the salmon on top, then bake for 9 minutes. 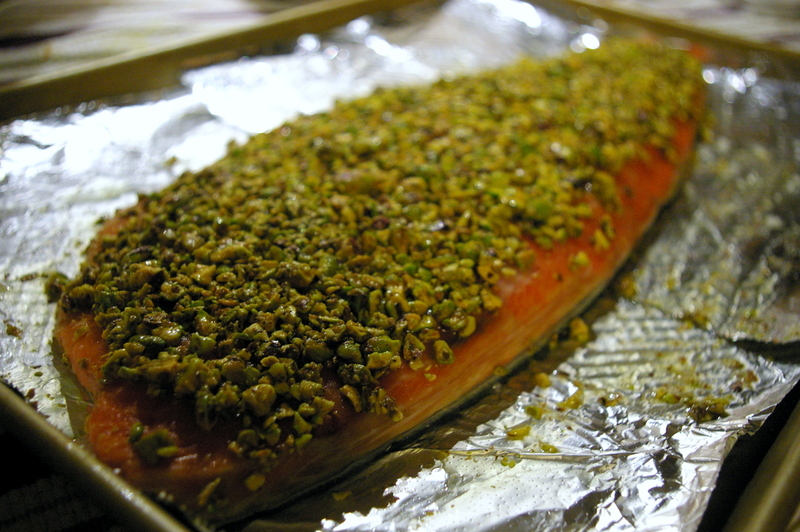 When the timer rings, put the broiler on for two minutes to toast the pistachio nut crust. 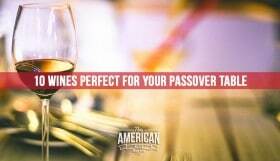 Remove from the oven and serve warm or at room temperature.